Fujifilm has finally confirmed its X-T100 mirrorless camera. The camera, which popped up on the company's European website last week before being quickly removed, appears to be the most junior X-T-series model to date, positioned just beneath the X-T20. Like that camera, the new arrival packs a 24.2MP APS-C-sized sensor, although, much like the one inside the X-A5, it appears to be a conventional Bayer RGB-type sensor, rather than an X-Trans CMOS III sensor that's used in its pricier stablemates. This is joined by a 3in LCD screen that responds to touch, with a clever three-way-tilt mechanism that allows it to be tilted up and down, in addition all the way around so that it faces the same way as the lens. There's also a 2.36million-dot electronic viewfinder with a 0.62x magnification, and the combination of a pop-up flash and hotshoe for those needing extra illumination. The X-T100 is even capable of capturing 4K video footage, although only to a maximum 15p – otherwise, it records Full HD video to a maximum 60/50p. The Intelligent Hybrid AF system makes use of phase-detect AF pixels located on the camera's sensor, and Fujifilm claims that it has employed a newly developed algorithm to improve performance. The camera becomes the latest recipient of Bluetooth technology, which the company has recently integrated into the X-A5 and FinePix XP130. This provides compatibility with smart devices running the Fujifilm Camera Remote app for instant image sharing, in addition to the company's Instax SP-3 printer for those wanting physical copies of their images. Today's announcement comes after a busy few months for Fujifilm. 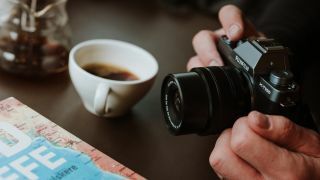 The company has already launched the X-H1 and the above two cameras, in addition to the Instax Square SQ6 and a handful of new optics since the start of the year. Together with the XC 15-45mm F3.5-5.6 OIS PZ as its kit lens, which was announced at the start of the year, the camera will be available in Black, Dark Silver and Champagne Gold finishes, with an asking price of £619 in the UK and $699 in the US. Pricing for other territories has not yet ben confirmed. Fujifilm expects the camera to arrive in late June.